Home Amihan LPA Northeast Monsoon PAG-ASA Tail-End of a Cold Front Weather PAG-ASA Weather Update - issued 5:00 PM today, 15 December 2017. PAG-ASA Weather Update - issued 5:00 PM today, 15 December 2017. 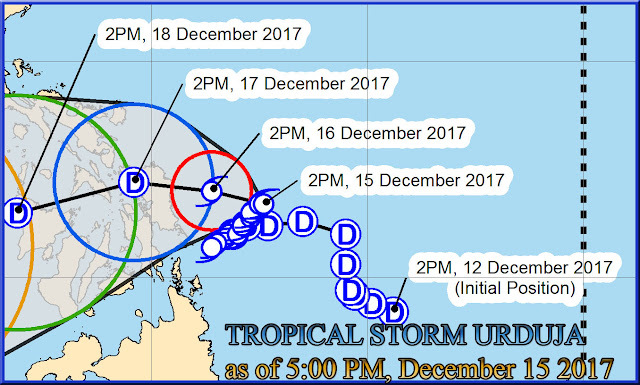 PAGASA TRACKING FORECAST issue 5:00 PM, 15 December 2017. As of 5:00 PM today, 15 December 2017 - TS "URDUJA" REMAINS QUASI- STATIONARY AND CONTINUE PUTTING EASTERN VISAYAS AREA IN SERIOUS DANGER. At 4:00 PM today, the center of Tropical Storm "URDUJA" was estimated based on all available data at 240 km East of Borongan City, Eastern Samar (11.8 °N, 127.6 °E with maximum sustained winds of 75 kph near the center and gustiness of up to 90 kph moving Northwest at 5 kph. Expected to make landfall over Northern Samar - Eastern Samar area between tomorrow morning and afternoon. Estimated rainfall amount is from moderate to heavy within the 500 km diameter of the Tropical Storm. Scattered to widespread rains will continue over Eastern Visayas and Caraga and is expected to prevail over Bicol Region and the rest of Visayas within 24 hours. Residents of these areas must undertake appropriate measures against flooding and landslides and coordinate with their respective local government and disaster risk reduction and management offices. Sea travel remains risky over the eastern seaboards of Bicol Region and of Visayas due to the approaching Tropical Storm. TS"URDUJA" will bring stormy condition in places of Northern Samar, Eastern Samar, Samar, andBiliran. Rains with gusty winds in places of The rest of Eastern Visayas, Bicol Region, Romblon, Marinduque, Northern Cebu, Capiz, Aklan, Northern Iloilo, and Dinagat Islands. Cloudy skies withscattered rainshowers and thunderstorms in the rest of Visayas, Zamboanga Peninsula, Northern Mindanao, CARAGA, CALABARZON, and the provinces of Mindoro and Palawan. Metro Manila and the rest of Luzon will experience Cloudy skies with scattered rains due to Northeast Monsoon. PAG-ASA Weather Update - issued 5:00 AM today, 16 December 2017. PAG-ASA Weather Update issue 8:00 PM today, 15 December 2017.